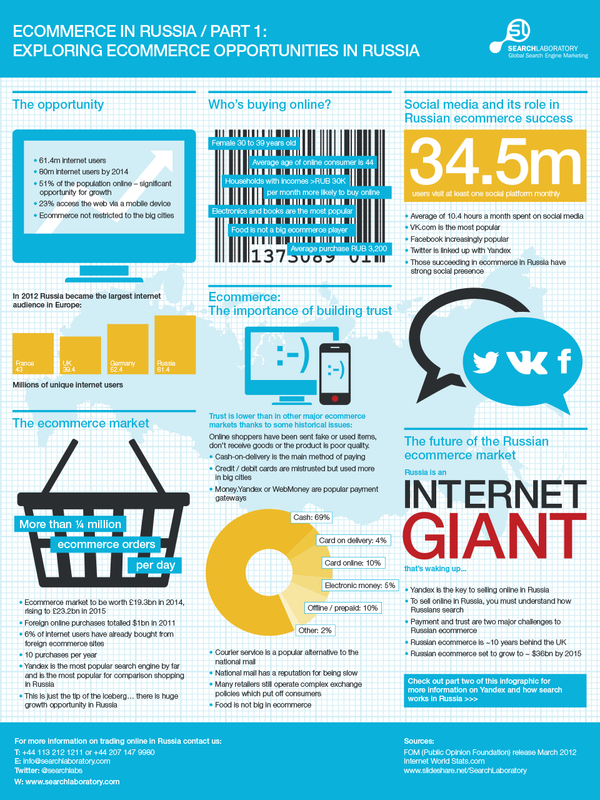 Famous for its vodka rather than its ecommerce, Russia in fact boasts the highest number of internet users in Europe. And because of a history of fraudulent domestic online vendors it is home to a consumer base that is more inclined to buy from established foreign brand names. The UK is home to some of the best ecommerce businesses in the world and the nation's online sales rank fourth globally. ASOS, one of the few foreign ecommerce businesses to venture into the Russian market, is a shining example of this. The fact that more retailers have not followed ASOS in their eastern expansion is surprising though as Russia is an online market brimming with potential. Historic obstacles such as an inherent distrust in online payment methods have been mitigated by a cash-on-delivery system. Now a member of the World Trade Organisation it is also easier for foreign companies to do business in the country. While the same language barriers that exist for expansion into countries like France and Germany are present in Russia (here’s a tip, have your translation done by a mother-tongue speaker), there is one major challenge to overcome that is almost unique to the Russian market: Yandex. I use the word challenge because Yandex is a completely different arena to Google when it comes to online marketing and advertising. Yandex is the dominant search engine in Russia with over 60% of the market share, it also accounts for 45% of the country’s total online advertising market share. Without Yandex your ecommerce operation in Russia is in the fast lane to failure. Ian Harris is the CEO and founder of Search Laboratory, and a guest blogger for Econsultancy.